Our guild was born just before Thanksgiving, 1992. We are by far the most complex guild on 3k. The guild object is the single largest collection of code on this mud. This doesn't even include all the guild rooms and items. There were once only 10 circles of power. Reagents were once not a part of the guild. At one point there were only two necromancers, Tensor, the guild coder, and Thor, the first guild member. Once, the guild was located in the 'Blood of the Vine Inn' in Ravenloft. At one point the guild had only 10 powers. At one point, there were only two guilds, the Necromancers and the Knights. 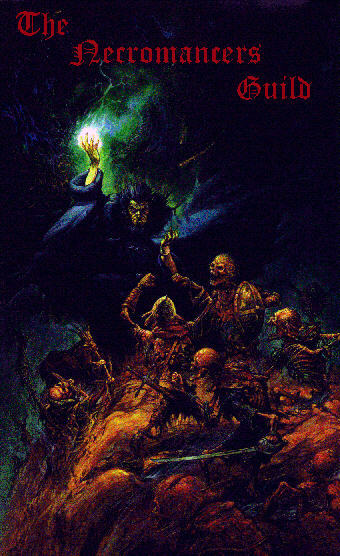 The Necromancers, at one point, did not have undead forms. The Necronomicron was once a general object anyone could gain. For about 10 months, the reagent, ginseng, was mispelled as ginsing. There was once a locate spell which could tell the exact location of another. Imagine the time when worth went down with EACH spell. The alchemy potions once were a part of our guild uniquely. There were once guild hall branches, which could be used as teleports to certain realms and areas. The guild hall used to be 4 rooms, and Pyool was the only person. You once had to kill the behemoth to get an obsidian rod. This rod then formed into your necromantic rod when you joined. Without it, you couldn't have joined.